CCC's Halo Wars Launch Site: Reviews, Previews, Cheats, Videos, Screenshots, and more! Microsoft and Ensemble have put together an RTS to remember. Defeat The Covenant in this unique take on the Halo franchise! Groundbreaking Xbox 360 strategy game: Since inception, Halo Wars was explicitly designed to bring a typical PC genre to console gamers. Commanding armies is easy, controlling troops and units effortless, and epic battles are smoothly handled using an intuitive user interface. Halo Wars represents the true next-generation experience, combining a masterful control scheme with the award-winning strategic gameplay only developers Ensemble Studios can provide. Strategic command of armies in large-scale combat: Gamers are in command of the battlefield, playing as either of two unique civilizations: UNSC or Covenant. Use various combinations of leaders and units, and create countless strategies tailored to your preferred playing styles. 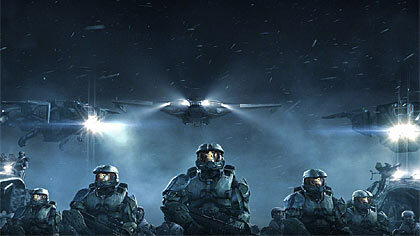 New take on a legendary world: Experience the early battles between the UNSC and Covenant, in a time predating Halo. Join the crew onboard the Spirit of Fire, a Phoenix-class colony ship converted for UNSC military use, and guided by the A.I. persona Serina. Ready to get the most out of Halo Wars? Don't forget to check out our cheats section, where you'll find cheats, tricks, hints, and everything you need to know about secrets and unlockables included in the game. Keep checking back for more!